"Recognizing that academic achievement without compassion and concern for others is meaningless, we are committed to purposeful involvement in the world outside our school in both the local and the global community." This sentence from our Statement of Philosophy best describes Derryfield's understanding and commitment of its connection and responsibility to the greater community. Middle and upper school students have numerous opportunities to become involved in our community; through projects integrated into the curriculum, service days, service to the school, and ongoing opportunities with the middle and upper school service clubs. Service is also an important component of many of our global programs. By definition, community service is performing volunteer work of any kind that benefits the community (internal or external to the School). Our students help out in many capacities: including working at the local soup kitchen and shelter, tutoring elementary school ESL students, participating in fund raising walks, assisting with Special Olympics, and teaching for the Breakthrough Collaborative. Service Learning projects have specific curricular goals and outcomes and are often incorporated into a class. All sixth and eighth graders participate in classroom based service projects that involve our students with the immigrant and refugee community in Manchester. Upper School courses also provide opportunities to participate in service learning projects. 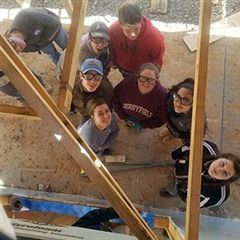 Whether Derryfield students graduate with experience building a house for Habitat for Humanity, leading tours for prospective students and parents, or serving food in the soup kitchen, we are confident that service to the community and compassion for others are values that they will carry with them as they move forward in their lives. For more information on Community Service and Service Learning at Derryfield please contact Danielle Llewelyn at 603.669.4524, ext. 2105.